I must have read that inscription on Scarborough's War Memorial on top of Oliver's Mount many times. In the beginning, in my younger days I cared little about the words, or of the eight hundred or so names that the memorial commemorates, but as the years have gone by I had begun to wonder who those men were who had been 'wall unto' the people of Scarborough during those terrible years 1914 to 1918, and had given their lives in the process. It wasn't until 1998 that I decided to set out to find who those men of Scarborough had been, and what had been their fate [if it was at all possible]. As far as I know the task has never been undertaken before, all those men [and women] who had died whilst on active service in the Great War to all intents and purposes had simply 'died' and that had been an end to it. I believe there was some talk in the years following the war of putting together a 'Roll Of Honour' to commemorate the town's fallen, but to the best of my knowledge this was never accomplished, so the words that you are about to read in the following pages stand as my personal tribute to those ''fallen' of Scarborough who had manned the walls in defence of Britain during the so called 'Great War'. Obviously to gather information about all the seven hundred or so servicemen included on the memorial would have been a Herculean task, which I am afraid [at the moment] I have not been able to achieve. Therefore, in an effort to narrow the required field of research into an acceptable figure I have scoured Scarborough's cemeteries in search of names of soldiers, sailors, and airmen who had been commemorated on family headstones in the years after the war, in all I was to find over three hundred names. Many of the men highlighted in the following pages are the fruits of those many months of roaming Scarborough's three burial grounds. There are, however, men included in my narrative who are not commemorated in the towns cemeteries, they are included for a variety of reasons, two of them belong to my family, the remainder are either buried in the same cemeteries as their fellow townsmen, or because they are simply from Scarborough, and I have obtained information relating to their demise. Much of the personal information relating to the men included in my work has been gathered over nine years of combing the pages of 'The Scarborough Mercury' the town's newspaper throughout the war, which, thankfully, are contained on microfilm in the Reference Department of Scarborough Library. Every Friday during the war the newspaper had included a sometimes-lengthy column under the heading of 'Scarboro Casualties', containing the names of the majority of Scarborough's war casualties. Many of these columns contain a wealth of priceless information about the men that I would otherwise be unaware of and without which my project would, quite frankly, have never reached the drawing board. Many of these snippets are included in the text exactly as they appeared to the people of Scarborough as they had perhaps mulled over their teas, and learnt who else from the town had died, or had been injured during the war. 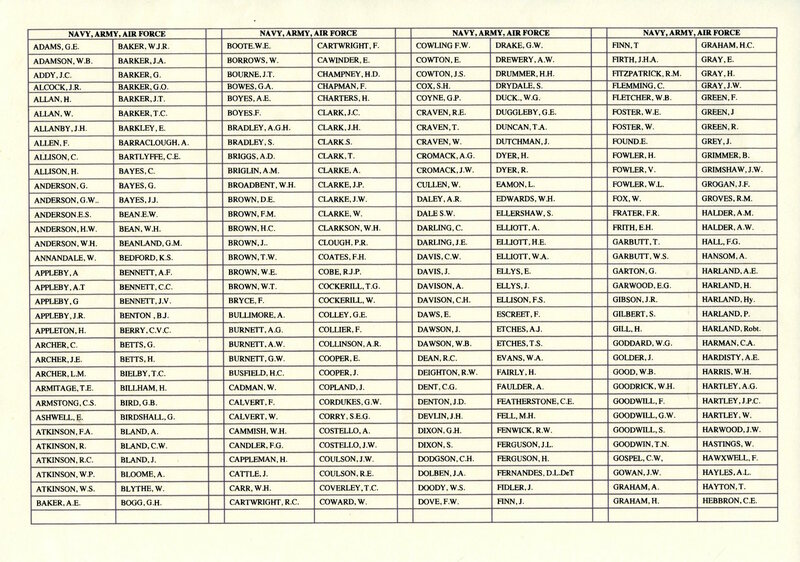 Alas, many of the men included in my text, particularly those killed in the larger operations such as Arras and Passchendaele in 1917, and the various German Spring Offensives of 1918, had appeared in name only in Scarborough's casualty lists, giving very little information to go on, therefore, in many cases the information available regarding all the men, many of whom lived relatively short lives, is scant, and in many is non-existent, which is a pity. Since taking on my project I have come to realise how very little information we, as ordinary people leave behind for the generations that follow, telling of what kind of people we were. Perhaps we should all sit down at some point in our lives and put onto paper our own biographies. 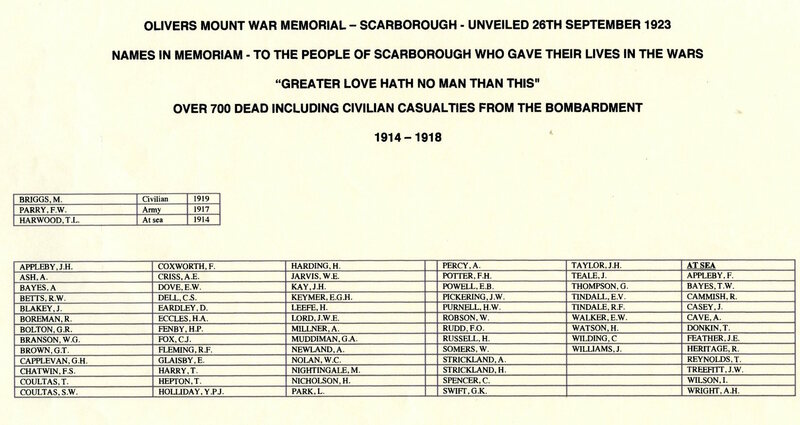 So who were these men of Scarborough who had gone off to the Great War of 1914 to 1918? The majority of them were in their early twenties and came from the 'lower' class of the town, labourers, boot repairers, gardeners, fishermen, cab drivers, refuse collectors etc, who had enlisted for a variety of reasons, patriotism was, it is presumed, the commonest, but I also believe that many of the men had gone off to the war out of a spirit of adventure, and a way of escape from their humdrum, and sometimes poverty stricken lives. Indeed, many of the young men who had enlisted in the early days, had done so to be in on the fight before it was too late, and the war be all over, as had at the time been expected by Christmas 1914! The younger men had also often enlisted as a means of getting out of the tedious apprenticeships, which they had been shackled to since the age of thirteen until the age of twenty-one years. We must also remember that they were very poor times for the majority of the town's population, many of the men would have been working in jobs prior to the war that demanded very hard labours for very little financial gain, and the prospect the 'King's shilling' per day wages [5p] all found of the British soldier was a brighter prospect than the abject poverty that many of them were forced to living in, unfortunately they were not to be much better off as events turned out. A few of the men featured had also enlisted from better paid jobs, clerks, postmen, policemen, shop assistants, tram drivers and conductors. Many were also the sons of wealthy parents who had lived in fine houses in the affluent South Cliff, Valley Road, and Falsgrave areas of Scarborough. Some had been public school boys, for whom to join in the war had been 'the done thing'. A few of the town's soldiers had been regular army soldiers or sailors, men who had already seen extensive service before the outbreak of the war, many of them the 'Old Sweats', who had probably drank in every watering hole from Chatham to Cairo and knew little of life outside a ship or barracks. Amongst these had also been included in the rush to war were the older men, many in their thirties and forties who had already seen action in the South African War of 1899-1902. Scarborians had also rallied round the mother countries flag from all walks of life from as far away as Canada, Australia, and New Zealand. All the men's names featured in my text can be found on Scarborough's Oliver's Mount War Memorial, nevertheless, as you will find many were not native to the town, however, most of them were living in Scarborough, or had had relatives living there by the beginning of the war and many had enlisted for service from the town. 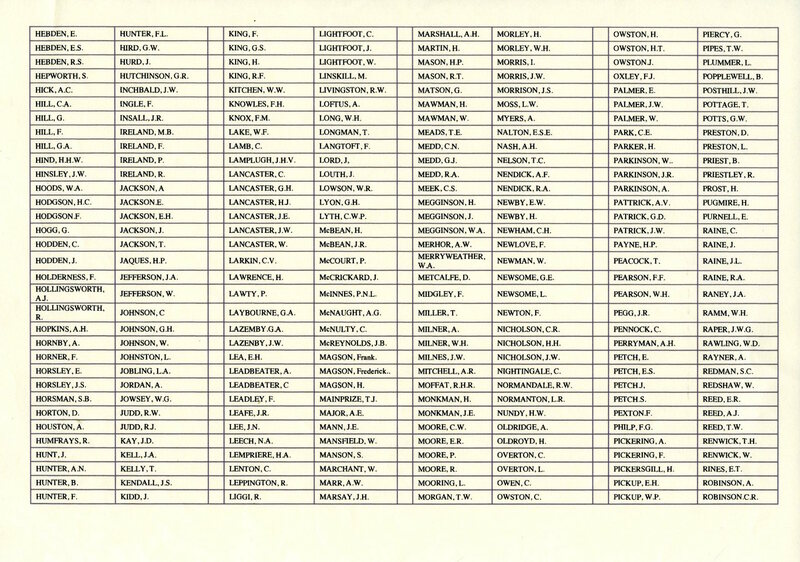 However, in couple of instances the author feels the casualty had not been of the town, and may never have even set foot in Scarborough at all, their names being added after the war from the lists of casualties that had been compiled by the town's council from information submitted by relatives. The majority of the included men had lost their lives in some of the largest and most dreadful battles the world had ever seen, Ypres, Loos, Jutland, the Somme, Arras, Passchendeale to name but a few. Throughout I have tried to show these huge struggles from the men's unit's or ship's point of view, and in so doing have illustrated but a minute segment of an otherwise huge operation. This is intentional, and those who choose to find more about those huge struggles for supremacy on land or sea, I recommend they look towards the more learned volumes than mine that are readily available. Here I must stress that I am purely an amateur in the history of the First World War, and indeed of my hometown of Scarborough in those desperate years. Even after nine years of research into the Great War of 1914 to 1919 [the official end of the war] I remain fairly ignorant, but a little wiser than I did in the beginning and the words you will read in the following pages have, quite understandably, not come easily, each chapter appears after many day's and night's of painstaking work, poring over old reference books, and conjuring with words well into the early hours when any sensible person would have been tucked up in bed. But that is where the 'Great War', as hypnotic as it had been in 1914, holds a persons attention. Many people like me are still falling into its shell holes, never to be released by its deadly grasp. Although my book is intended as a memorial to the men of Scarborough who had lost their lives whilst on active service during the Great War, and whose final resting places remain 'neath a foreign sky', it would be criminal of me not to also include in this memorial the people who were left behind. The parents, who in many cases lived for many years following the death of their young, and often only son's, the brothers and sisters who in many instances lived their lives having never known a brother, the wives who would live without a cherished husband, the children who would never know their father. Where possible I have included information regarding these, whom I believe were also casualties of the war. I have endeavoured to include the names of the military units and formations in which the casualties had been serving at the time of their death, therefore I feel it necessary that I should explain some of the military terms found throughout the text. In the British Army of 1914- 18 the smallest unit in the army had been a Section consisting of about 10 men commanded by a non- commissioned officer [a sergeant or corporal]. Four sections made a Platoon, commanded by a subaltern [lieutenant or second lieutenant], four platoons made a Company, with a senior captain or major as company commander and five officers under him. 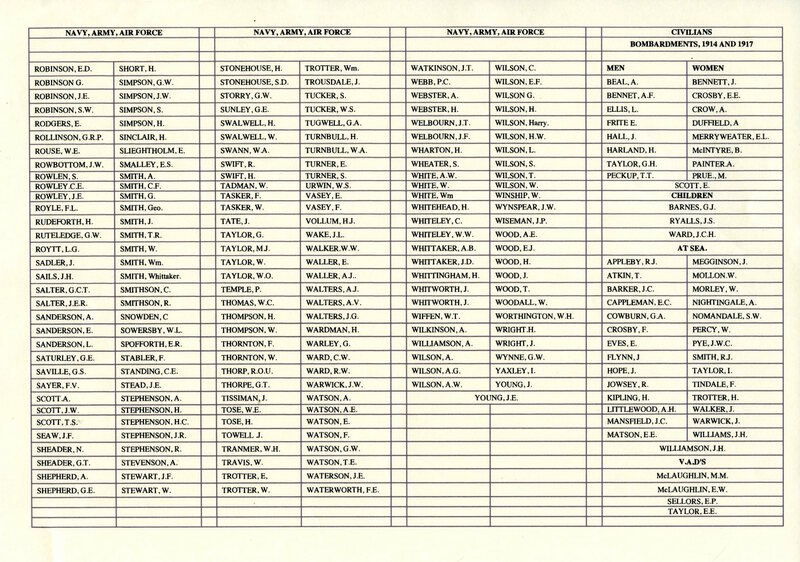 Four companies made a Battalion [30 or so officers and 992 other ranks], commanded by a major or lieutenant colonel. Two to however many battalions formed a Regiment [some regiments during the war had over forty battalions] commanded by a colonel. Four battalions, plus an artillery battery, made a Brigade. Three Brigades, plus artillery, engineers and administration [18,073 all ranks with 76 guns and 24 machine guns], made a Division. The marching depth of a division being around fifteen miles. Two or more divisions made an Army Corps. Two or more army Corps made an Army, which had been commanded by a General. The Royal Field Artillery, along with the Royal Garrison Artillery [which had been armed with much larger guns], had been divided into Batteries .A Battery being commanded by a major with a captain as second in command, and consisted of six guns. There were three Sections of two guns each with a subaltern in command, each separate gun had a sergeant in command, each gun team had limber carrying ammunition for the gun, both of which had been towed by six horses. A Regiment of Cavalry had also been commanded by a lieutenant colonel with 25 officers and 497 men under him that had been divided into three Squadrons. Each squadron was commanded by a major and consisted of four Troops, each commanded by a subaltern. Each troop was divided into Sections, which were commanded by non commissioned officers. Fortunately Royal Naval personnel, including Royal Marines [unless serving ashore in the Naval Brigade] had none of this palaver and had merely had a number and a 'Home Port' or base, which could have either been Portsmouth, Chatham, or Devonport [Plymouth]. At the beginning of my research someone had asked if my book had included any heroes. At the time I had replied no, but as the years have gone on I have found that all the men featured in my book, and for that matter all the men and women of Scarborough that had served in the First World War had been heroes, the majority having never received their due recognition of the trials they had faced. I hope my book goes some way to illustrate what fine people the men of the town had been during the war of 1914-1919. At the start of the war Scarborough's local press had included many photographic images of the town's 'fighting sons'. Amongst these many images I had found a number that had shed light on some of the casualties included throughout my text. Unfortunately, the passage of time has made some of these images unprintable, but some have made their way into print and I am indebted to the Editorial Director [Mr Ed. Asquith] of the present day Scarborough Evening News for allowing me to show that handful of men to you. Finally, Instead of using the conventional contents page I have opted, at the start of each chapter, to list the names of the men included in that particular segment of my book under the banner 'R.I.P.' an extravagance perhaps, but I prefer to list them this way. Details of names on the memorial can be found by clicking on this link.